RLI was evaluated in the first randomised controlled trial of an educational intervention designed for children with Down syndrome, and one of the largest of any study of children with Down syndrome to date - funded by the UK Big Lottery Fund. The study was conducted by researchers at Down Syndrome Education International and at The Centre for Reading and Language at the University of York. RLI was evaluated in a large randomised controlled trial (RCT). Randomised controlled trials offer a high standard of evidence by evaluating outcomes for participants who are similar to one another at the outset and are randomly assigned to one of two groups - usually an intervention (or 'treatment') group and a control (or 'no treatment' or placebo) group. This study design can give us greater confidence that any differences in outcomes that we observe between the two groups are due to the presence (or absence) of the intervention being evaluated. In our study, the 'treatment' was the reading and language intervention. 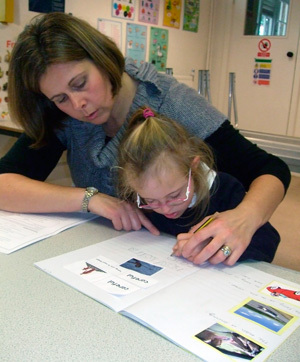 Our control condition was 'teaching as usual' - the typical reading and language instruction provided to children with Down syndrome included in UK mainstream primary schools with one-to-one support. After the first phase of the study, the initial control group also received the intervention and we continued to evaluate the progress both groups made. Throughout phases A and B, when first the initial intervention group (1) and then the waiting control group (2) started the reading and language programme, the Teaching Assistants delivering the intervention were fully supported by the research team. The Teaching Assistants followed a scripted intervention, were contacted by telephone or email every two weeks, and were observed once each term. At the beginning of the project, the average age of the children was 6 years and 11 months, ranging from 5 years 2 months to 10 years. The measures illustrate the extent of their receptive and expressive language delay at this time. The average word reading score is not included in the table as 21 children could not read any words (reading age below 57 months) and 3 children were at ceiling on the standardised measure (reading ages above 92 months). The schools decided when to deliver the intervention each day. For some children it replaced their usual class literacy instruction but for others it was an additional literacy session. For some children the intervention was delivered as one 40-50 minute session, for others the reading and language strands were delivered at different times during the school day. Children were not always supported by the same TA all day and so in some schools one TA delivered the reading strand and another TA delivered the language strand. In other words we took a flexible approach and the schools worked out what was going to be the best way for them to deliver the programme.